Taxis are found everywhere in India and are probably the most prominently visible means of transport irrespective of whether a tourist emerges from the airport or the railway station or if you need a taxi for a complete round trip for several days or even weeks. However, being well informed with regards to this particular subject always works to one’s advantage as the armament of knowledge can be effectively applied in practical situations and enable one to weave through his vacation successfully bereft of any bad experiences. In India, taxis or cabs are four-wheeled cars, the models varying from the Premier Padmini and Hindustan Ambassador of the yonder to the contemporary Maruti and Tata small car models. Since these come directly under the purview of the Government, they are required to conform to the color regulation of being either black-and-yellow or completely yellow. While the former combination is a common sight in Delhi and Maharashtra, the latter are characteristic of Kolkata, West Bengal. There are two ways in which one can avail these Government commercial vehicles namely either by hailing them on the street or going to the nearest taxi stand, joining the queue and waiting for one’s turn to come. The usual trend in metro cities like Delhi, Mumbai and Kolkata is scanning the road for any empty cab, hail the cab driver by shouting ‘taxi’ and jump in after having mentioned the destination. Tourists who intend to indulge in sightseeing have another alternative at their disposal, namely hiring a private taxi which is very unlike the Government owned taxis in terms of appearance and billing system. These taxis do not have to conform to any particular color and the choice of vehicles offered is much more as well. Thus, apart from the standard Maruti, Tata or Ambassador, one could opt for a Hyundai Santro, a bigger vehicle like a Tata Sumo, a Mahindra Scorpio or a Sumo Victa in case of a large group so that the entire group could travel together, or luxury cars like a Honda City, Toyota Innova or Hyundai Accent in case comfort is the first priority. 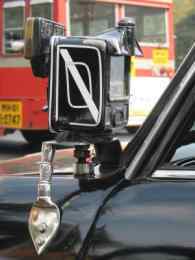 Likewise, one might opt for an AC or non AC taxi depending on personal preferences. The charges of the taxi service in India are decided in a number of ways of which the most reliable are the pre paid and meter based methods while the most unreliable is the one settled through personal bargaining. Regulation deems it mandatory for all taxis to follow a meter-based billing system but at places where this system is defunct due to negligence of law, one would be better off with the prepaid option rather than get into a bargaining spree. This is because since the stipulated amount has already been paid at the booth, the passenger is less likely to be subjected to a round robin trip or possible harassment by the cab driver. In India, it is also possible for an individual to call a taxi to his doorstep although he might be charged extra for this special service. In order to avail this service, one needs to be cognizant with the names and numbers of organizations which make taxi bookings on being called up and provide a door-to-door dropping facility. Likewise, every city has its own list of taxi service providers who can come in handy while embarking on a tour. These providers present the client with a long list of vehicles from which the tourist can pick one which is best suited to him in terms of size and budget. Since these are private taxis, the charges for these are based either on the distance covered or the duration for which it is on hire. Charges may also vary as per the destination of the traveler as a journey, for example a trip to a hill resort might cost much more due to the arduous drive. An alternative to this system is to avail a shared taxi which proves to be economical or an auto rickshaw which is definitely cheaper and comfortable for two.